Two groups who are working to improve the viability and vitality of Presque Isle’s downtown area have stepped up to serve as lead sponsors for the Color Presque Isle 5K. The Presque Isle Downtown Revitalization Committee [PIDRC] and Presque Isle Healthy Maine Streets [PIHMS] program are teaming up to provide strong support for the event, which is raising money for arts programming in downtown Presque Isle. 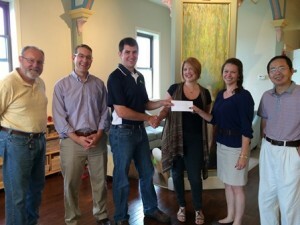 Officials representing the lead sponsors and Color Presque Isle event gathered on Aug. 22 for a check presentation ceremony at the Wintergreen Arts Center. Presented by the University of Maine at Presque Isle and the Wintergreen Arts Center, the Color Presque Isle 5K is one of The County’s most unique and fun-filled 5K fundraisers. During the event—which takes place on Saturday, Aug. 30 at 9 a.m. at Riverside Park—participants dress in white, get showered with colored powder throughout the course, and finish looking like a work of art. Last year’s inaugural event, the first of its kind held in Aroostook County, had more than 400 participants of all ages and running abilities in attendance. Presque Isle Healthy Maine Streets’ mission is to create a vibrant downtown through community leadership focused on developing place-based worksite wellness. Healthy Maine Streets connects small businesses with creative opportunities to make the healthy choice the easy choice. Healthy people build downtown vitality, fuel economic growth and strengthen quality of place for future generations. The City of Presque Isle was awarded a $20,000 grant through Healthy Maine Streets, which builds on the Maine Downtown Center’s proven downtown revitalization framework to leverage community health improvements in a number of Maine towns and with a combined population of 180,000. The Presque Isle Downtown Revitalization Committee’s mission is to encourage the community to preserve and reinvest in the economic, aesthetic, and cultural future of Presque Isle by promoting the viability and vitality of the downtown area. Working closely with the City of Presque Isle, the City Manager and staff, the City Council, and Presque Isle Area Chamber of Commerce, the PIDRC partners with businesses, as well as civic, professional, and educational organizations, to accomplish its work. A volunteer-driven organization, the PIDRC has adopted the National Main Street USA 4-Point Model. “The Color Run aligns perfectly with the goals of the PIDRC and PIHMS initiatives and goals to promote a vibrant downtown and draw people to the area,” said Leigh Smith, Chair of the PIDRC. The Color Presque Isle 5K is also being supported by MMG Insurance, UMPI’s Student Activities Office, TAMC, Katahdin Trust Company, Huber Engineered Woods and Northern Athletic Supply. The registration fee for the event is $40; children under 10 are free. Registration is payable by cash, check or credit card. Course maps will be available at check-in, which will be underway on Friday, Aug. 29 from 5-8 p.m. at Wintergreen, and on Saturday, Aug. 30 starting at 8 a.m. at Riverside Park. Register at www.umpi.edu/colorpresqueisle5k or in person at Wintergreen Arts Center in Presque Isle. For more information, please contact Heather Sincavage at heather.sincavage@maine.edu or contact Rowena Forbes atwintergreenarts@gmail.com or 762-3576.